In the old days, I’d sneak out of school or better yet work and check out what was new at the local record store. I can almost smell the incense burning while the tattoo’d, stoned staff bustled around the store arranging stacks of records. I could spend hours going through the racks and racks of beautiful vinyl. I’d gaze lovingly at the artwork, turn the record over to read the track listing. Always on the hunt for something new, or something undiscovered. I was always looking for that fabulous high when the needle hit the groove and something great exploded from the speakers. In each record store, there was always a chalk board or a some kind of notification, “Upcoming Releases”. God, I miss those days. Now, I have to pour over Rolling Stone magazine, social media. or worse go out to the iTunes store and search the “Pre-Sale” list. I do wonder what happened to all those hippies that used to work in record stores. I have to imagine that they’ve all migrated out to Colorado and are working in the pot dispensaries. Well, at least that’s what I hope for them. I’d hate to think they all became used car salesmen. As a follow up to the B&V “Upcoming 2016 Albums” post, I went out and to check out what might be coming out over the next couple of months, April and May ’16. Some of the stuff I knew about, some of it was a surprise. As a public service to rock fans every where, I thought I’d post what I found. This list, as all my lists, is not meant to be comprehensive, but these are records I’m interested in and thought you might be too. If I missed anything, please use the comments section to let the people know about the new rock and roll. We can pretend we all work in a giant virtual record store. Ah, that incense is burning…. Mudcrutch, “2” – As mentioned in the upcoming 2016 LP post, Mudcrutch’s new album, creatively titled “2” (it’s their second album) is coming out May 20th. The first single “Trailer” is a song that was an outtake to “Full Moon Fever” and an early version of the song is available on the superb boxed set “Playback”. The song is a nostalgic trip back to Petty’s youth, which when you think about it, the same could be said for Mudcrutch in general. I love the new tune and look forward to hearing more. Petty wrote 7 of the tunes and each member contributed 1 song. My buddy Storm already has his Mudcrutch tix for the Denver show… I can always count on Storm! Eric Clapton, “I Still Do” – Clapton has been largely dead to me since “From the Cradle” his fabulous blues album. He hasn’t done much since then that you wouldn’t find in the “easy listening” aisle. The first single, “Can’t Let You Do It” which is a laid back shuffle akin to much of his latest stuff. The reason this record caught my eye was it’s produced by legendary producer Glyn Johns who produced “Slowhand”. Maybe he can bring something out in Slowhand again this time. There are originals and a couple of interesting covers including a Dylan tune “I Dreamed I Saw St Augustine”. Intriguing but my hopes are definitely not “up”. This one is also May 20. Peter Wolf, “A Cure For Loneliness” – I never liked the J Geils Band. “Musta Got Lost” was the only tune I really connected with. However, Peter Wolf on his own has released a series of great albums including 2010’s “Midnight Souvenirs”. I was a little discouraged to hear a couple of the tracks were recorded live, but that’s probably me being a music snob. This one will be high on my radar… It’ll be out in April. Cheap Trick, “Bang, Zoom, Crazy… Hello” – I’ve been a little down on these guys since they booted Bun E. Carlos out of the band… However, their album from a few years ago, “Rockford” earned a lot of creative buzz. The four tunes that are already on pre-release are vintage Cheap Trick. Great riffs and those Beatlesque harmonies… Due out tomorrow, April 1st, I can’t believe I’m saying this but I might end up buying a Cheap Trick record for the first time since I conquered acne. That’s the scoop over the next couple of months. As always, pour something strong, turn it up loud and enjoy. As part of this tour Bruce is performing ‘The River’ in it’s entirety, from start to finish. Ah, the album playback-centric concert. It can be dicey. Playing an album as it was released can often produce mixed results. I saw Motley Crue do ‘Dr Feelgood’ a few years back and left disappointed. I saw the Cult do ‘Love’ and ‘Electric’ and those shows were amazing. Of course the Cult is a hard rock band (and could really be defined across genre’s) so there is a cohesion on those records that lend themselves to a concert treatment. Of course, for the ‘Electric’ show I was drinking vodka with the Rock Chick and my buddy Stormin’ in Denver and I actually got a VIP package and met the band so that may have influenced my feelings about that show. ‘The River’ was my first Springsteen album purchase. I grew up in the suburbs of Kansas City, in Kansas so Springsteen was a bit foreign to me. He didn’t get a ton of airplay out here. I had only recently switched my radio from Royals’ games to KY/102 the lone rock station in town. I’d heard some Bruce but wasn’t that familiar with him. “Hungry Heart” was literally the first “hit” he had out here. I can still remember standing in the record store, the smell of incense in the background clutching the double vinyl album wondering if it was worth the investment. A double album in those days could be close to $15 which was a fortune on a lawn mower/bus boy wage. In those days, if I liked the first single on an album I’d wait until I heard a second then a third song. If I liked all three it was deemed “purchase-worthy”. What can I say, cash was in short supply when you spent half of it on beer and gas. I can say, all these years later, thankfully I made the buy. I remember the jolt I got when the needle found the groove and “The Ties That Bind,” the opening track, jumped out of the speakers. It was like a jolt of amphetamine. I realized I’d made a very sound investment. Springsteen had been kept out of the studio for 4 years after ‘Born to Run’ and then had been very selective on what he put out on ‘Darkness On the Edge of Town’ so he had a back log of great songs that he’d been playing live (and being bootlegged) for some time. He had originally submitted a single album but wisely pulled it back in favor of this sprawling, masterpiece. Over the course of 20 songs the Bruce and the E Streeters do everything – rockers, rockabilly, ballads, politics, love, breakups, a wreck on the highway, literally everything. Every double album that comes along gets compared to ‘The White Album’ but this one may actually earn that description. The title track to ‘The River’ is one of Springsteen’s finest achievements as a songwriter: he captures the political ramifications of an economic downturn in the most personal way, and it’s much more effective for it. It appears on this tour Bruce is opening with a song from ‘The Ties That Bind’ box, “Meet Me In the City Tonight”. How did this song not see proper release long ago? I can only hope that some day I’ll actually get my Xmas gift and hear the studio version (Damn you Santa). “Meet Me In the City” is an awesome opener. It just shows the depth and quality of the material Bruce was writing at that time. From there the E Street Band takes you through ‘The River’ in it’s entirety. It’s an amazing start to this concert (and I do mean “start” the show is 3 1/2 hours long). ‘The River’, with the way the album was paced, is a great album to play in concert. It’s music and moods are varied enough to withstand a concert treatment. Bruce tells a nice story before “Independence Day” which was a song I listened to constantly in my “angry-at-my-father” stage of life (does everybody go through that?). “Drive All Night” may be my favorite Springsteen love song. “Baby, I’d drive all night, just to buy you some shoes” is the line that always gets me and the way my wife buys shoes ended up being somewhat prophetic for me. After they complete ‘The River’ album playback, it’s party time. I’ve looked at the set lists from other shows and they vary wildly. On the ‘Chicago’ show he plays several songs from ‘Born to Run’ and ‘Born In the USA’ (including “Cover Me”, “Dancing in the Dark” and “No Surrender” where Bruce blows the intro twice). He also plays “Human Touch” a song I’ve never heard live and was surprised to hear. Bruce even does a nice acoustic/violin version of “Take It Easy” as a tribute to Glenn Frey which is understated and powerful (although I would have loved one of Bruce’s patented pre-song stories about, say, Warren Zevon and Frey and he hanging out, but those records are probably sealed). After a towering run through “Rosalita” the party comes to an end with the old R&B tune, “Shout”. I’ve heard Springsteen, Billy Joel, and Tom Petty all do this song, and frankly no one will ever top Otis Day and at the Knights from the movie “Animal House” but the E Street Band do a great version. The vocals on this live show are right up front. The Capetown show I purchased, the vocals were down in the mix, which was disappointing. Not so on this album, the sound is terrific. Since Clarence Clemons passed away Bruce has augmented the band with an entire horn section. For ‘The River’ Tour he’s paired it down to only Jake Clemons, The Big Man’s nephew. I must say, I was impressed with Jake’s playing. No one will ever play with the distinct power of Clarence, but his nephew does him proud. I like this stripped down version of the horn section. I am also very happy to see Bruce’s wife Patti back on rhythm guitar and vocals, she’s been missing the last couple of tours. Little Steven, who co-produced ‘The River’ is up front and appears to have replaced Clarence as Bruce’s main on-stage foil. I think we all love Little Steve, so this is good news. The sound of this recording is really great. I don’t think ‘Chicago January 19th’ is still being offered for free, but it’s certainly worth the purchase price. My advice is to look at the set lists for his different shows, pay particular attention to the songs after song 21 where ‘The River’ concludes and pick the set of tunes you like. This is an epic tour and it appears Bruce is working on yet another “solo” project so it may be a while before you hear the whole band perform together again. Fans of “Live Music” recordings, look no further. Enjoy and as always, Cheers! My obsession with bootleg recordings is well documented on BourbonAndVinyl. I can still remember going back up to college my junior year. When I arrived, my friend and one of my future roommates, Drew arrived triumphantly holding a shoe box full of newly minted cassette tapes (yes cassettes, it was a long time ago, I also had a mullet). He announced that he had found the “motherlode” of Springsteen live bootlegs and it was his advice that we listen to all 10 cassettes, one after the another, immediately. After quickly mixing several large pitchers of vodka and Rose’s lime juice, aka the dreaded Kamikazes, we hunkered down. This was during the week prior to school starting and there were numerous parties around campus, chock full of drunken, new female co-eds in need of male upper class-men “guidance”. But were we joining in the fray? No, we were listening to some of the greatest live recordings ever laid down. I can still remember the excitement I felt hearing Springsteen and the E Street Band on those ’75 and ’78 bootlegs, at their prime strength. The music was spectacular, as was the Kamikaze inspired hangover. I now know what death tastes like, it tastes like Rose’s lime juice and Popov (Idaho’s finest vodka). A year ago or so, I heard that Springsteen, much like Pearl Jam and the Red Hot Chili Peppers, was releasing select concert recordings on the 2014 tour as MP3 downloads. Pearl Jam has been doing this for years. When they started, I went a little overboard and bought say, four or five of them, immediately. Patience and discipline is in short supply at BourbonAndVinyl. Springsteen went on to release every single show on the 2014 tour which was made extra special by the presence of guitarist Tom Morello (Rage Against the Machine, Audioslave, The Nightwatchman). The E Street Band already had 3 guitarists including Bruce, but hey, you can never have too many guitars. I actually bought the 1-29-14 show from Capetown, South Africa. I showed a bit more restraint than the Pearl Jam situation. Shortly after the 2014 shows were released, Springsteen released the E Street Band’s first show ever at the historic Apollo Theater from March 2012. It was a great show, broadcast live on XM/Sirius Radio. The penultimate moment was Springsteen calling for a moment of silence for his fallen comrade-in-arms Clarence Clemons, during the song “Tenth Avenue Freeze-Out”. It was at the moment in the song when Bruce sings, “…the change was made up town and the Big Man joined the band…” If that doesn’t bring tears to your eyes, you’re not human and you’re certainly not a fan of Springsteen’s. Shortly after that, Bruce announced he’d be releasing “archival” recordings of select concerts from the past. I felt that old, pre Kamikaze excitement return. I felt like a junior in college and my roomie Drew had just showed up with a shoebox full of cassettes. Now, here at BourbonAndVinyl, I try to keep a very close eye on new releases from veteran acts. I scour magazines and social media but even I missed a few of these archival releases. Like the post on the Dylan Official Bootleg Series, I thought I’d compile a quick run down of these live releases. I believe, these live releases constitute as important a set of recordings as Dylan’s Bootleg Series. All of these have been remixed for MP3 or CD release. Full disclosure – I do not own all of these. Again, the restraint thing took over. The wife would have thought I’d gone crazy. This is more of an attempt to chronicle and shine a spotlight on these recordings, in case you’ve missed them. I must say, the ones I own, sound fantastic. 1975 – Tower Theater, Philadelphia, PA – The 75 tour in support of Born To Run. I have this tour, uh, somewhat covered with other recordings, acquired in a shoebox my junior year in college. Ahem. Anyway, this is a great show from Philly. I love that “Mountain of Love” is on here, a great cover tune Bruce was still doing in those days. 1978 – The Agora, Cleveland, Ohio. This was the tour in support of Darkness On the Edge of Town. This was described by Rolling Stone magazine as Bruce’s greatest live album. This tour is where the legend was born. This show opens with a cover of “Summertime Blues”. Listen and prepare to understand the myth. 1980 – Nassau Veterans Colesium, Uniondale, NY. This tour was in support of The River, which was my first Springsteen album. He came to my hometown on this tour and my buddy, unbeknownst to me, had 2 tickets. He took somebody else because he didn’t think I was into Springsteen. I should say, ex-buddy. It was described in the paper as “the concert of the year” and it was only February. So, naturally I had to have this concert. It’s also very special as it was a New Year’s Eve show on Bruce’s home turf. This is a mind-blowing show. My bootleg experience had never covered this tour, which I consider as important as 78. 1984 – Bryndon Byrne Arena, East Rutherford, NJ. The Born In the USA Tour. What a show this was. This was the tour I first saw Springsteen. If the bootlegs had made me a convert, this tour made me a disciple. If you listen to all of these shows in chronological order, you get a sense that this show is the culmination of something. He built this live show from 75 forward, adding new material, dropping old stuff. It all starts to makes sense why he completely changed directions after this tour. 1988 – LA Sports Arena, Los Angeles, CA. The Tunnel of Love Tour. This is where the Boss, perhaps freaked out by the mega-fame he’d faced after Born In the USA, decided to try and reinvent himself and the band. He changed where they stood on stage, the set list, and the approach to the shows. I never heard much about this tour, but I love the setlist. I remember hearing they played the Amnesty International shows with Sting and others at the end of the tour which marked a decidedly political turn for Bruce. This one is on my shopping list. 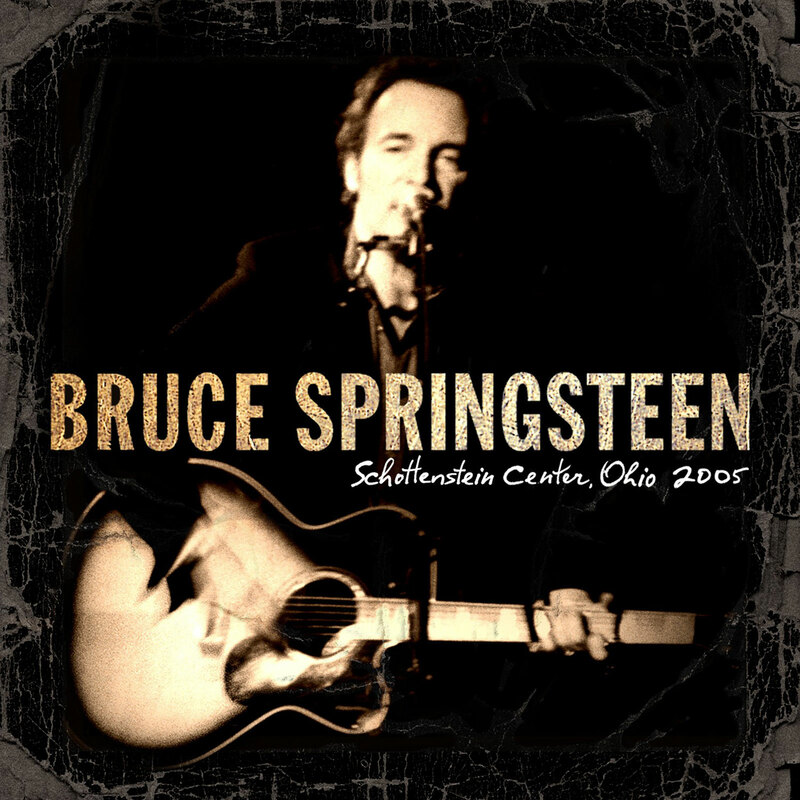 2005 – Schottenstein Center, Columbus, Ohio. Devils and Dust Tour. I just found out about this show over the weekend. I purchased it immediately. This is the first recording I’ve heard of Bruce solo – no E Street Band, no band at all – just him and an acoustic guitar, harmonica, piano and what sounds like an electric piano. I love this show. Its quickly slipping into high rotation. He opens up with an obscure gem he did for a movie soundtrack, “Lift Me Up” and the set list meanders from there. Someone in the crowd interrupts Bruce as he’s leading into a tune and yells out a request, “Growing Up”. Bruce just says, “Nah, I’m not playing that one tonight…” Play what you want Boss, the deeper you go into the catalog the better. This does feature a ton of the Devils and Dust LP, so be prepared. So there it is folks, a quick recap of Bruce’s archival Live releases. Check it out, maybe you’ll like one… or maybe like me on the Pearl Jam bender, you’ll buy them all. You can’t go wrong with any of the releases listed here.